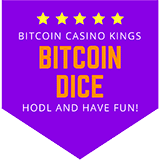 Bitcoin Dice Guide (2019) - Best casinos listed with Bitcoin dice games! In this article we present you some of the most popular Bitcoin dice games and where to play them. 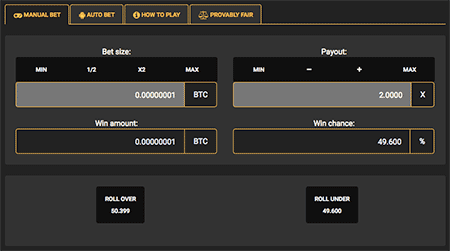 Play Bitcoin craps, sic bo or classic BTC dice or live dice. There are also many very good bonuses to almost all sites listed here. Read also about different Bitcoin dice strategies and why they usually fail. But of course, using them just for fun is not a bad idea! DuckDice offers one provably fair Dice game with hilarious bonus games like the Duck Hunt. All of these sites offer also jackpots and other bonus rounds in the dice game. 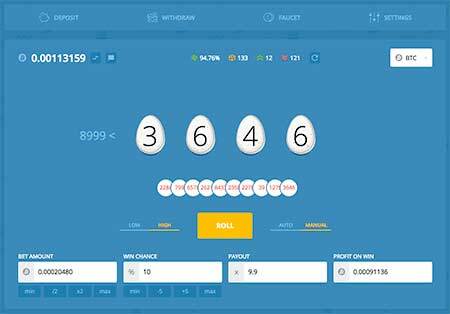 For example when writing this, the dice jackpot in FortuneJack is enormous 3.6 BTC! DuckDice site on the other hand offers many interesting bonuses like Faucet, Rain and Duck Hunt. This is the Dice game at CryptoGames. Graphically the classic Bitcoin dice games aren’t special. The gameplay however is fast and provably fair, and the house edge is low. You can also play dice games like Bitcoin craps. 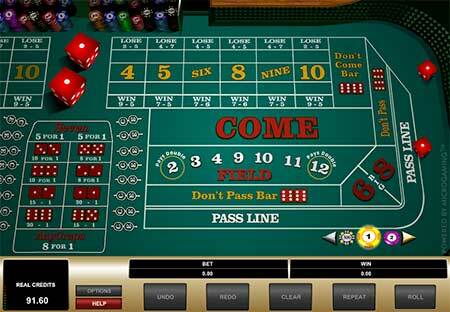 In craps players are rolling two dice and you must bet on the various combinations of the result. Most of the larger Bitcoin casinos have craps in their selection. This is Vegas craps from Quickfire. Screenshot from BetChain casino. Sic Bo (骰寶) also known as tai sai (大細), dai siu (大小), big and small or hi-lo is very old game played with three dice. The game has origins in ancient China. The meaning of Sic Bo is “precious dice” and the later names mean “big or small”. 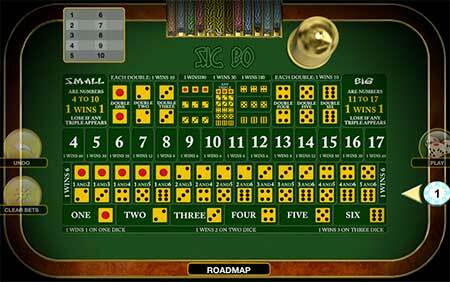 In Sic Bo you must guess the outcome of 3 dice by placing wagers on the table. 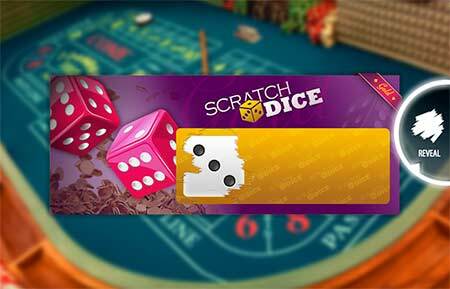 Scratch dice is an instant lottery game that combines elements of a scratch-off ticket and a dice game. Each ticket has a covered area that you need to scratch to find the outcome. The outcome is a combination of 3 dice faces. Each dice face can have from 1 to 6 dots on it, so they are normal 6 sided die. 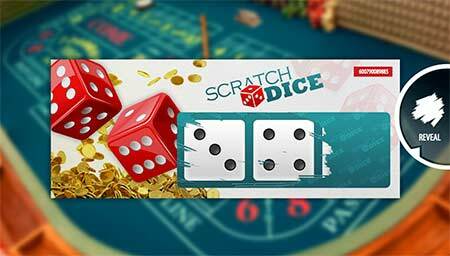 Scratch Dice game from Betsoft. This is a combination of a scratch-off ticket and a dice game. This is a Gold Ticket bonus round in Scratch Dice where the payouts get a big boost. Example of a BitCasino live casino with live dealers through a video connection. In many Bitcoin casinos you can play for free using play money. For example Bitcasino.io offers the possibility to play for free. That is a good way of practicing your Bitcoin dice strategies or just having fun with no risk. You can find many different dice strategies when searching the internet of reading gambling books. You can find for example Martingale, Reverse Martingale, D’Alembert, Fibonacci, James Bond etc. strategies. However dice (and Bitcoin dice) is a game of luck, so every strategy is as good as the others. In blackjack, your strategy has a big effect on winnings, but in dice strategies don’t matter. Why is that? Why Bitcoin dice progressive strategies fail? If you now win, keep your winnings and use the original small bet again. Now you have regained your previous losses. Instant money? Whats’ the problem? Let’s simplify the idea and imagine a simple OVER/UNDER dice game. So you have to guess if the dice result is UNDER (numbers 1, 2, 3) or OVER (let’s say dice numbers 4, 5, 6). There has been a pattern of UNDER, UNDER, UNDER and UNDER. Now you have lost 4 times and doubled your bet 3 times. The next one has to be red, right? Mathematically previous random events don’t affect on the next random event. So the next 4 rolls could still be UNDER. In progressive strategies you will most likely run out of money, because you have to always double bets if you lose. Theoretically, progressive systems could work if you had an infinite bankroll. But still, there is the small house edge in the game which lowers the dice return to player rate to slightly under 100%. Dice games are games of luck, so every throw of the dice is 100% random. The movement of the dice is very complicated and chaotic. You just cannot predict the outcome even if you had the most powerful supercomputer in the world. What if there has been 100 consecutive UNDER numbers? The next has to be OVER? Believe or not, the 101. spin can still be UNDER. Every spin is random and the previous spins don’t affect the next one. The die don’t have memory. However in a long time scenario, the amount of OVER and UNDER results should come close to even. But random events are still funny: if you would calculate the OVER and UNDER in one year, there could still be imbalance between them. And there is still nothing wrong. That’s just how random events work. Nobody could predict the outcome of that year before the end. The OVER or UNDER could be on the lead or they could be even. You just cannot predict random events. Are there hot or cold numbers? Short answer: no. Dice games are still 100% game of random events! There are many Bitcoin dice strategies to follow. Of course no system can give you a 100% winning rate, but these systems you can try. Here are some different dice strategies, if you still want to follow one. Or maybe you are interested about strategies just for fun, there is nothing bad about that. Martingale System is maybe the most popular money management system in casino games and also qualifies as a Bitcoin dice strategy. It works like this: you double the amount you wager every time you lose. With this strategy, by the time you win you get all your lost wagers back from your previous rolls. The Martingale system needs a decent bankroll in your Bitcoin dice account. Reverse Martingale System says that you double your bets every time you win. If you lose, you will decrease your wagers. In system called One Half Up you will not increase your wagers if you have not won two wagers in a row. You increase your bets by 50% of your original bet. This was our article about Bitcoin dice games, strategies and sites to play dice. Thank you for reading!